Over the past few weeks I’ve been finding more time and energy to paint as I’ve left (exited) my church. I found going there increasingly stressful. Playing the piano was part of it but more than that I had trouble managing my relationships and being together with so many people at once. I found I was beginning to dread it. There was too much noise and it was too busy and I was expected to have too much communication with people for my autistic mind to manage. Every time I got things wrong I became more stressed about interacting. It was like a finger puzzle, the harder I tried to make things right the worse things got until I couldn’t do it anymore. Initially I was going to have a temporary break but I kept getting nightmares about going back so now I have decided to make this change permanent. The relief is incredible. I feel like I can breath again. I am also very sad though, because there were so many really good people there and I miss them. I guess with the autism it was always going to be a difficult place for me. The fact is I can’t manage it. Quite a while ago I tried to paint how I feel about my Christian faith. Because it means so much to me I found that it was just too difficult to do. Then a week or so ago I sketched a picture of a shepherd with a lamb on his shoulders which kind of said what I wanted to say. Then I had a go at painting it with Winsor and Newton Artists Watercolours..
It’s not perfect at all but it does touch my heart in the way I wanted it to. It just has, for me, that feeling of being loved and cared for which I get from my faith. Because of the autism I have a lot of difficulty accurately communicating what I really feel with words which I find very frustrating especially when people start getting upset with me and I’ve done the very best I can do. My language skills are pretty good generally but I don’t have the usual social context in which most people seem to operate – I’m always misunderstanding the effects which my language has and not getting the whole social aspect of communication. For me, saying “A, B and C”, just means, “A, B and C”. There is no social context, no what they call ‘side’ no ‘reading between the lines’ (which means understanding that there is a subtext in some communication) because I am basically blind to all of this. I can’t ‘see’ social context or non-straight-forward communication. But with pictures I feel that I have a genuine way I could potentially communicate well and accurately in a way which isn’t constantly misunderstood. I have a fighting chance. Who says robots can’t be girly? I would like to draw a simple comic book / manga robot. I have been fascinated with robots since I first started reading Iasaac Asimov’s books as a child. Now I have difficulty imagining things from scratch. I try to do this a lot but my imagination doesn’t really work that way. So, when I want to make something original and new I first look at all the great robot-type designs that are already out there. Often there are bits and pieces that I like and don’t like in each design. There are also design elements from other characters and objects which also seem to help. More brilliant Star Wars droids. Wall-E from the film of the same name. This is actually Spectreman by the artist ‘Dreamflux1’ from Deviant Art but I think he would make a cool robot design. I think that looking at a range of representations of robots helps me learn the visual language of my subject. Once I’ve got a feel for it then ideas start to flow – not always the best ideas but it’s a start. Looking at these designs I can see elements of C3Po in the first one and elements of a Star Wars Storm Trooper’s helmet in the second one. However I felt that the first one was too comical and the second I just didn’t really like very much. One of the things I love about robots is when they don’t have eyes in the way that we as humans might recognise them. These two were following along with the Steampunk kind of theme. I imagined part of the hemet being metal and part of it being made of leather – like a robot version of a pair of goggles. I quite like both of these designs but my favourite is the bottom one – but only just. So, I decided to make a big version of the one I liked the most in a few days time and to ink the other three now as they are. I used three different pens to ink these three robots. On the top left I used a new Kuretake pen. I loved the way it allowed me to vary the line width by just using pressure on the tip. It also had a beautiful stark black ink which really shows up wonderfully on the page. Because it was so different in terms of feel to my usual inking pens (Staedtler 0.1, 0.3, 0.5 and 0.7 Liners) I found it hard to control. It also took longer to dry than my normal pens which resulted in some minor smudging, but it wasn’t too long – just not ultra quick. There was also some bleed of ink into the paper. I think this probably says more about the poor quality paper I’m using than about the pen. Overall the ink quality and width control were so good that I am going to practice a bit more with this pen to see if I can get some mastery over it. On the top right I used an Italian Dip Pen with some calligraphy ink. It was clearly NOT a success!!!! LOL I didn’t find dipping my pen into the ink every now and again too onerous, (in fact it made me feel like I was at Hogworts!!!) However, the actual nib was MEGA scratchy. It did give me a good variable line width and had more strength in the nib than the Kuretake pen which I liked but the ink took about 20 minutes to dry!!!! I totally couldn’t work with this. I’m going to modify things and have another go with dip pens at some point in the future using a better nib – I’ve got some good ones somewhere – and some quick drying ink. The dip pen nib holder was lovely to hold and felt comfortable and natural in my hand. The final ink was done in my normal way with my Staedtler 0.5 liner. It was easy to use although there is no way to vary the width of the line with pressure. I also found that the ink wasn’t very dark compared to the Kuretake pen. Who says robots can’t be girly?! Well, I wasn’t planning on painting a great deal before I move house but I got to thinking about the colours of clothes and this eventually led to a painting. Because of the autism I suspect, I hate clothes shopping, and at the same time I can’t wear clothes that don’t match properly colour-wise – it makes me feel sick. Plus clothes have to be comfortable for me and a bit big so they’re not tight. Basically I’ve not bought any new clothes for ages and my sturdy breathable waterproof jacket is getting harder to do up since the zip is breaking. Now last time I bought a new anorak I couldn’t choose the colour because of the stock they had available and I ended up with this horrible bright pink – yuck! I have struggled with it for two years now. So I decided this time that, no matter how much I hate clothes shopping, I would not buy something I wasn’t happy with. I ended up going for a nice navy blue breathable waterproof with a fleece inside. The main colour is navy blue with some small bits of orange. Then after ordering this online I thought about all the other clothes I need to buy and I decided that I would use a technique I’ve used previously, when I was first teaching. I was working in a Catholic primary school and I had to look smart, but my pay was very very low so I had to do it on a budget. I decide to opt for clothes all following the same colour scheme – that way, everything I owned would go well, colour-wise, with everything else. I chose browns and creams at the time and it worked really well. Plus I always secretly felt like a Jedi which was very useful in the classroom LOL!!!! (Although I never told the children or staff about this ). Now I currently wear a lot of jeans becuase they’re hard wearing, paint washes out quite well and I like blue. Anyway, eventually I came up with a limited palette which I like for all new clothes I’m going to buy for the next few years. First of all I was going to just paint patches of each colour just to see what it all looked like but then I drew out a simple pattern and made an abstract painting with the colours. It was a real blessing to work in abstract again – I love clear lines and shapes – so this project was fun. It’s painted in gouache with some gold acrylic on top using cold pressed watercolour paper. I’ve only just recovered from being unwell and already I’m feeling unwell again. It started with running a high temperature last night and having the nightmares I usually associate with being unwell. 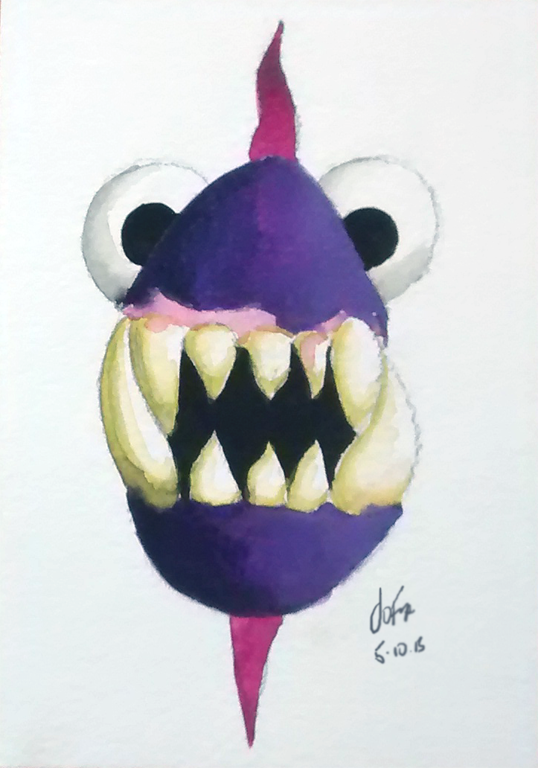 As a child I used to always dream of monsters when I was sick (hence the title of this section), but nowadays it’s usually some kind of scenario where I am accused of something I didn’t do and I’m then punished for it. I never even know what it is I’m supposed to have done. So today I have sore throat and a cough, my chest is sore and I have a big fat headache. I’m beginning to think that this tendency I have to get a lot of minor illnesses really often is perhaps related to my autism. Because of the autism I feel strong anxiety most of the time when I’m dealing with other people. To me, being autistic feels like being blind but having to pretend that you can see. Obviously I’m not visually blind – I am socially blind – but there’s no white stick or other visible sign to other people that I have these issues which makes life a bit like walking in a minefield because I never know when I’m going to make a mis-step. When things go wrong socially I really get really panicked and upset because I can hardly manage normal social relationships let alone big problems when people get angry with me. My “go to” response is to withdraw as much as I can and then, when I have to be social, to pretend it’s not happening and carry on. Sometimes this works but often it just gets worse and worse until I end up really upset. Getting really upset (having a meltdown) correlates for me perfectly with getting sick 24 to 48 hours later. I haven’t spoken to my doctor yet about this correlation but the more I think about it the more it seems to fit. If it is true (I’m thinking of it as a working hypothesis at the moment) then it might give me a way to prevent myself from getting sick so much – if I can manage my stress in better ways. I want to follow this up but talking about autism in the real world feels embarrassing (here on this blog I feel a bit more free). It would make a big difference to my life and my ability to work though if I could talk about it to my GP and learn how to get sick less. She is a really excellent GP so I’m sure she would listen and help – it’s just quite embarassing to talk about. SO I woke up feeling unwell and then, through the post, I got some new paints! What a brilliant way to get cheered up! These are Gouache Paints which are just like watercolour but they are much more opaque. Apparently they’re really versatile in that you can paint with them in the same way you might use oils or acrylics, or with a lot more water added, you can paint with them like you would with watercolours. When I found out about them I had to have a go. 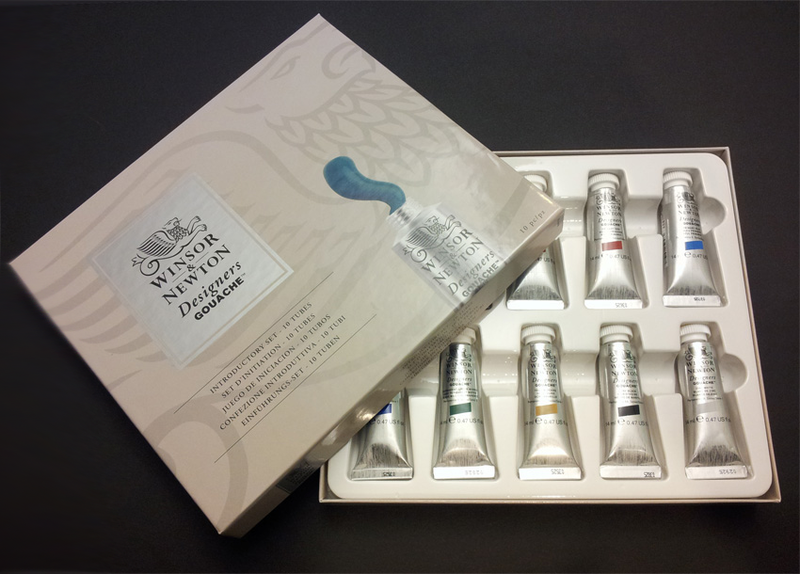 These are the ones I got – they were pretty cheap compared to W&N watercolours. 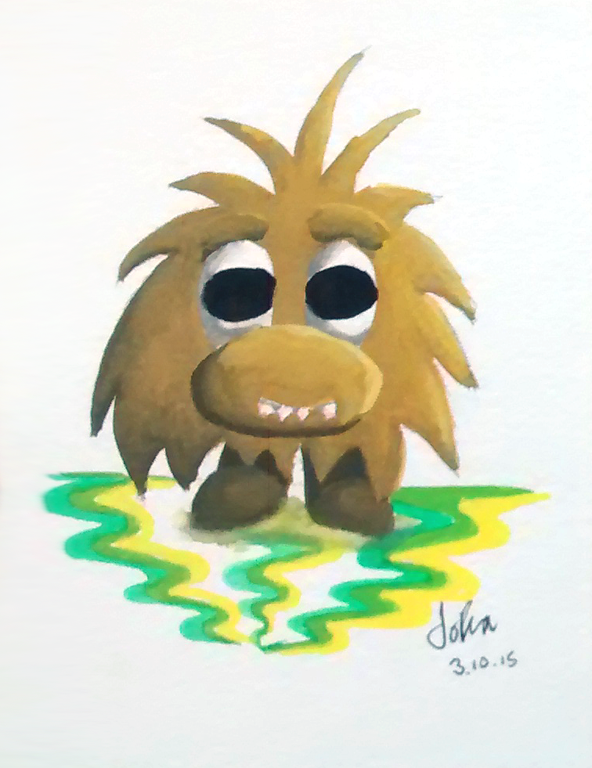 I began with some fun little monsters (since monsters were on my mind from being unwell). In these little mini-paintings I was just playing with the paint really – seeing what it could do and how I might be able to use them. (Each one is on A6 watercolour paper). Despite feeling quite off-colour I enjoyed working with these paints immediately. I love the way you can lay down a strong flat colour easily. This is something I find almost impossible in watercolour. I also found the way the paint can be blended to be absolutely perfect. It was amazing and dead easy to do. For me working in gouache feels completely natural – – it’s almost effortless – I love it!!! PS: to any other people with high functioning autism or aspergers out there – do you have any methods you use for reducing stress and coping when you’re about to meltdown? Also, do you ever find you get sick after having a meltdown? If you want to I would really appreciate any comments you could write on this. Thanks!